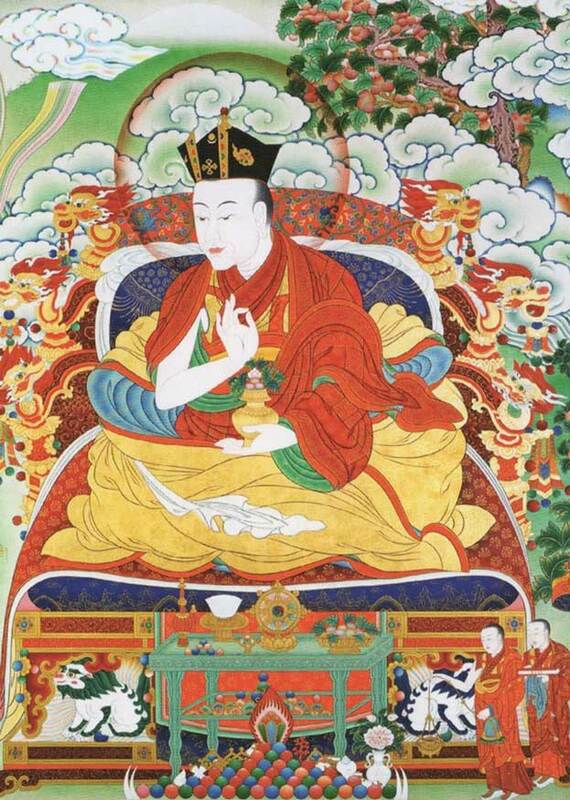 The Ninth Karmapa, Wangchuk Dorje, was born in 1556 in Tagtsang in the region of Treschöd, East Tibet. His father Ador and mother Ling Tsalo named him Namkha Gyalpo, before he received his ordination name of Mipham Chökyi Wangchuk. Whilst still in his mother’s womb, he was heard reciting mantras and soon after he was born, he sat cross-legged for three days and announced he was the Karmapa. At the age of five he was recognised by Chökyi Gocha, the Fourth Tai Situ Rinpoche, as the reincarnation of his precious root Lama, the Eighth Karmapa. A year later, Shamarpa Könchok Yenlak enthroned him with the Black Vajra Crown and gave him the extensive transmissions and teachings of the Kagyu lineage. It wasn’t long before Wangchuk Dorje began to teach. He lived most of his life in a nomadic encampment, much as the Seventh Karmapa had. It was a skilful way of spreading the Dharma throughout a region whilst preserving the monastic activities. In his garchen, strong emphasis was placed on strict meditation. In this way, the Ninth Gyalwa Karmapa travelled throughout Tibet, Mongolia, Nepal, and Bhutan, imparting teachings and restoring many monasteries and temples. He also played the role of peacemaker during the troubled political times in which he lived. He received an invitation to visit Sikkim. Unable to go himself, he sent a representative and founded three monasteries there, Rumtek, Phodong, and Ralang. The Karmapa consecrated the monasteries while performing a blessing ceremony at Tsurphu. He threw grains up into the sky that fell on the sites where these monasteries were then built. Rumtek Monastery became the international seat of the Karmapas in the 1960s, and Ralang home to Goshir Gyaltsap Rinpoche. Just like the Eighth Karmapa, the Ninth Gyalwa Karmapa was a brilliant author and wrote many commentaries on the Sutras and Tantras; comprising about ten volumes. His three treatises on Mahamudra: The Ocean of Certainty, Eliminating the Darkness of Ignorance, and Pointing out the Dharmakaya. They are the long, middle length, and shorter treatises, respectively, on the profound topic of Mahamudra. They became and remain still, vitally important manuals for the transmission of Mahamudra within and outside of Tibet. One of his closest and most well known disciples was Taranatha, who would become a hugely important figure in the Jonangpa and Shangpa traditions of Tibetan Buddhism. Wangchuk Dorje’s regent was the Sixth Shamarpa Chökyi Wangchuk. 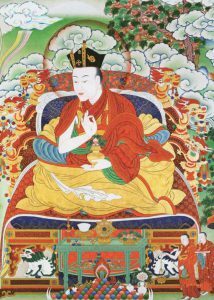 In 1603, at the age of forty-eight he passed into Parinirvana, leaving his prediction letter along with instructions about the next incarnation to Chökyi Wangchuk.